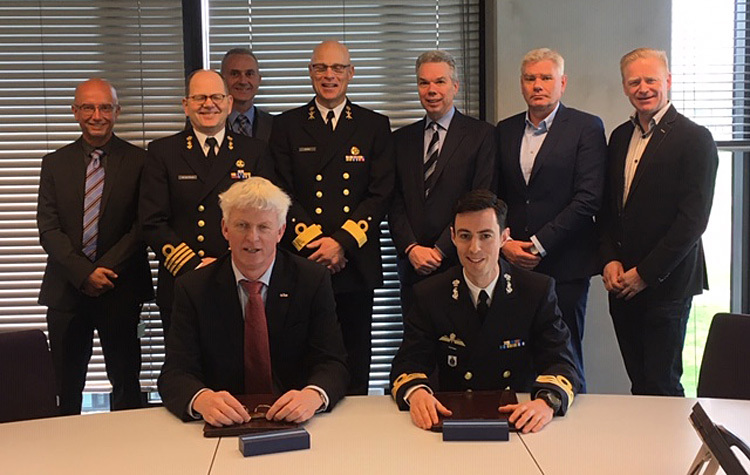 Damen Shipyards Den Helder (DSDH) and the Netherlands' Defense Material Organization (DMO) procurement agency have signed a contract for the design, build and delivery of a prototype Expeditionary Survey Boat (ESB). The craft will be optimised for rapid environmental assessments and hydrographic surveys in harbours, river mouths, shallow waters, coastal areas and shipping channels. The craft will be manned by four persons; two to crew the boat and two technicians to operate the hydrographic equipment, and will be able to spend up over 60 hours continuously at sea at her survey speed of 5 knots. DSDH is responsible for the design and engineering as well as the build, and the design will bring challenges. The contract requires that the ESB be capable of being transported in davits on board large logistics support vessels such as the JSS Karel Doorman and the LPD Johan de Witt,as well asother suitable vessels of the Royal Dutch Navy, to worldwide destinations so as to carry out its operational tasks over a number of days. "We are very pleased to have won this specialist project," says Jelle Loosman, managing director of DSDH. "We have eighteen months in which to build and deliver this vessel. It will be a small but complex project and we hope it will be a valuable addition to the Royal Dutch Navy." The ESB will replace smaller vessels of approximately10 meters that are currently used for hydrographic surveys but which are not specifically designed for survey work.